One of our all time favorite white Faugeres wines is made in Fos, a village nearby that is part of the Faugeres AOC. 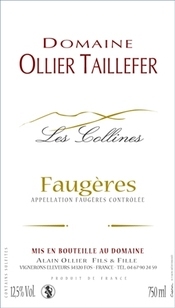 Domaine Ollier Taillefer is run by five generations of local winemakers. Both the reds and the whites are superb. Don't miss this wine! One of the joys of life in Caussi in shopping in local village markets each day. With the freshest produce and great oysters from the Intermarche, we often dine in splendor on the terrace. The most authentic, agricultural market is arguably Bedarieux. And the Saturday market in Pezenas (see photo) is totally charming, filled with handicrafts and in a spot surrounded by excellent spots for lunch, Medieval architecture, and antique shops. The owners, Régine et Christian Godefroid, have selected the very best wines from this extraordinary region offering tastings from over 30 producers and hundreds of different bottles. The shop features not just the wines of Faugeres, but also those of St. Chinian, Corbières, Minervois, Montpeyroux, Coteaux-du-languedoc and more... Highly recommended. Drink great wine very day for very reasonable prices. 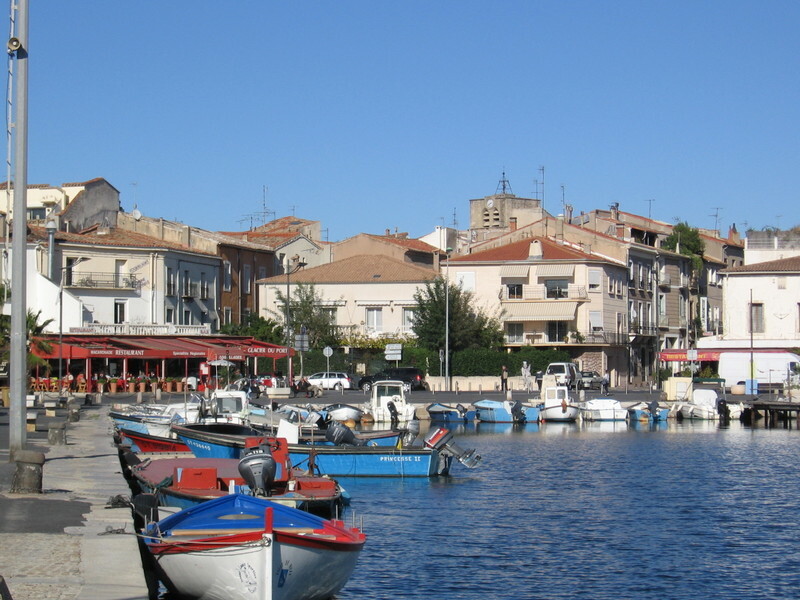 Friends who stayed in Caussi raved about the charms of nearby village Pezenes-les-Mines. "We thought it was a beautiful village to stroll and explore." Pezenes-les-Mines is a walled village -- a great example of the oldest villages in Languedoc, those that survived the Cathar and Crusader marches through the plains..
One fall day in 2007, we headed by car to Lamalou-les-Bains and then up the mountain to the hamlet of DOUCH, beneath the summit of Le Caroux. Douch is a perfect village where time seems really to have stood still. Half-a-dozen rough stone houses, inhabited by a handful of elderly residents, cluster tightly together for protection against the elements.. In the meadows below nestles a picturesque church with an ancient cemetery full of graves like iron cots. 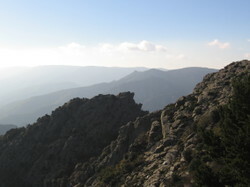 From Douch follow the path south of the village to the popular, easy 2.5 miles ascent of Le Caroux (1040m), where you’ll find extraordinary views from the summit along the mountain ridge, south to Beziers, the Mediterranean sea and even the Pyrenees, on a clear day. We could see the mountain goats scampering up and down over the rocks below. Walking back through the fallen fall leaves was exquisite—and we stopped in the charming inn at Douch for tea before claiming our car in the parking lot. The Auberges de Combes (tel 04.67.95.66.55.) offers a splendid meal in an exquisite gorgeous mountain setting (Closed Sunday evening and all day Monday). Although we’ve driven by many times, we haven’t stopped for a meal yet. The very first Caussi renters, the Hackman family of Kansas City, raved about their lunch at the Auberges de Combes so we recommend it. 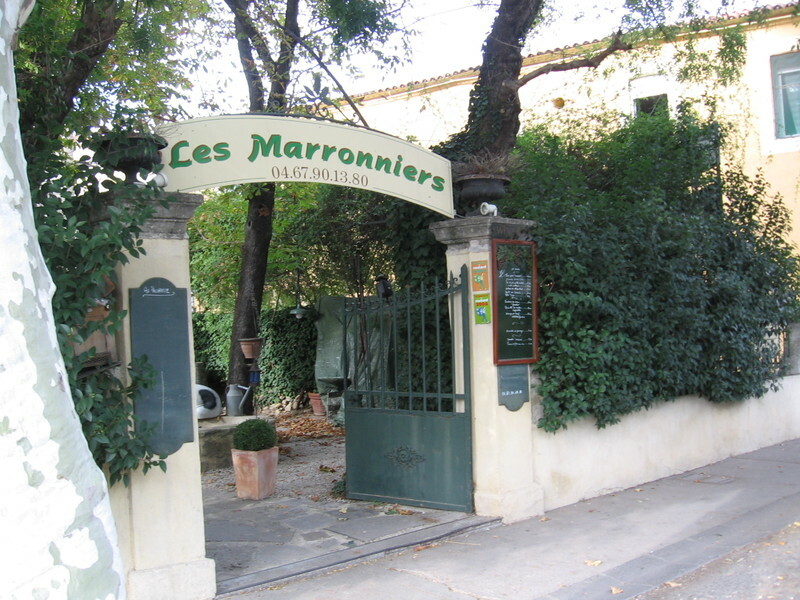 After a day of antique shopping and a visit to the Saturday market, we had a great lunch at Les Marronniers in Pezenas in November...Set a 19th century mansion with a beautiful courtyard lined with chestnus trees and outdoor tables for the summer, the dining rooms are charming spaces carved out of the mansion's parlours. At lunch, the cuisine is French traditional featuring veal dishes of the Lyons region.....in the e vening, tapas and Spanish cuisine are offered... 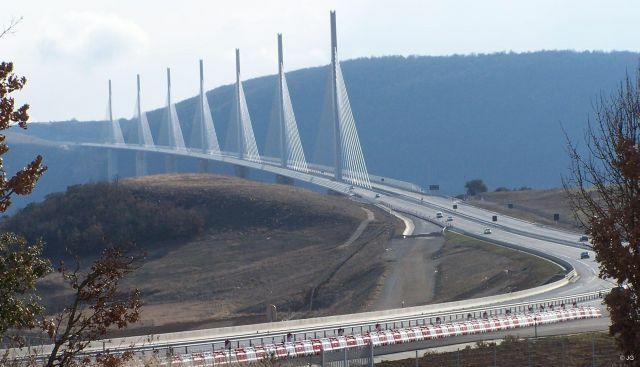 This restaurant was a huge hit with our French friends..
We were astonished by the beauty of the Norman Foster bridge at Millau, less than an hour from Caussi. Don't miss this easy trip (and stop for Roquefort cheese at the village of Roquefort en route). A DELICATE butterfly of concrete and steel, the viaduct of Millau soars across the sky as if eager to proclaim that no bridge on earth is taller. Yet its arrogant daring can surely be forgiven. It took a feat of engineering and a leap of the imagination to span the rough, rugged Tarn Valley less than an hour from Caussi. The gently curving structure dominating the skyline is best appreciated from a distance. When it comes into view, its appearance is always a surprise. The curved white suspension cables of the bridge blend so easily with a blue sky that when the sun is just right, the cables magically disappear, one after the other. 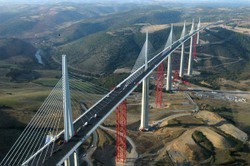 But from almost any angle, the Millau bridge radiates energy. On the approach by car on the A75 from Montpellier, for example, the bridge suddenly sneaks up from around a curve. On the drive along the winding road to the cheese-making town of Roquefort, it abruptly hovers overhead. The bridge is more than 50 feet higher than the Eiffel Tower (1,125 feet from the bottom of the gorge to the top of the pylon atop the tallest pillar), with a sweep of one and a half miles. Its architect, the British lord Norman Foster, used light, ultramodern materials to give drivers crossing the bridge the feeling of flying over the valley. He insisted that the roads used to haul materials and equipment during the three-year construction be covered over so the bridge would be surrounded by unspoiled terrain. Since it opened in December 2004, the bridge has begun to rid the sleepy region of its reputation as a way to somewhere else. The market on Wednesday and Friday at the central square is a local affair, where vinegars and violet garlic in bunches are sold at bargain prices. In ancient times, Millau was the site of some of the largest mass-production pottery factories in the Roman Empire, replacing Arezzo when Italian pottery became too costly to make. The Museum of Millau, in an 18th-century mansion, has a vast collection illustrating just how ubiquitous the pottery was: the stamps of 600 pottery makers have been found on the pieces here. For visitors interested in Millau's ancient history, Graufesenque just outside Millau is the Gallic-Roman archaeological site of an ancient pottery factory. Only a tiny fraction has been excavated; most of the remains are under the land owned by the neighborhood farmers. The site is enveloped in the scent of wild rosemary. Visitors are invited to picnic under the shade of cherry and walnut trees, where they may have a view of the paragliders who take off from a nearby mountain. Alain Vernet, the archaeologist who has been working here for 35 years, will show you where the slaves who worked in the factory were housed, as well as the location of the ovens, baths, kitchens, living quarters and a temple area. He can explain how up to 40,000 pieces could be fired in the 1,000-degree oven at the same time and how Millau once produced pottery for the entire imperial Roman army. To demonstrate how plentiful and easy to find pottery shards are, he has collected thousands of them in a pile encircled by a green wire fence. The Millau Office de Tourisme, 1, place du Beffroi, (33-5) 65.60.02.42, www.ot-millau.fr, can provide information on hotels and tourist sites in the region. Tours of the bridge are offered for $12. 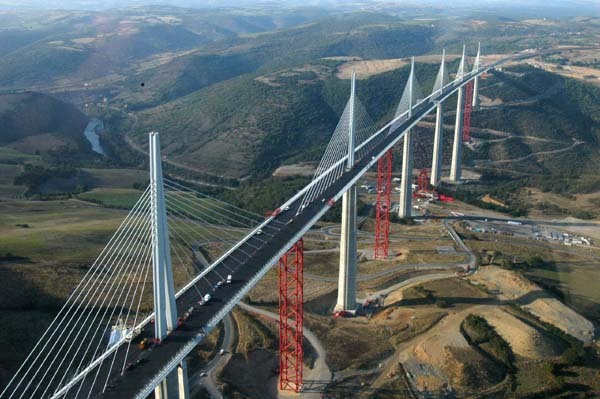 The Viaduc Espace Info, (33-5) 65.58.80.65, three miles on the D992 from Millau, is between bridge pillars P4 and P5. The toll across the bridge is $7.90 in summer; $6 the rest of the year. 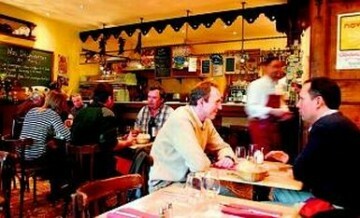 For information, visit www.leviaducdemillau.com. 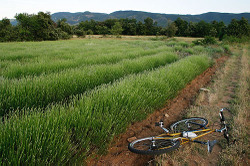 From Stephen Kling (July 2007): I had a great time in Caussi, largely because I was able to fit in a half day of bike riding almost every morning, still getting back in time for breakfast. In fact, I dragged a full-sized touring-bike-in-a-box all over Europe for that very purpose. The back roads in France are narrow, seldom travelled, and beautifully, even obsessively, paved, and I loved 'em. Route numbers in France for back roads like these are, at best, a symbolic gesture, since one number can seemingly indicate many roads that are only distantly acquainted. We kept stumbling over D158, and its cousins, D158b, D15b8, and never did understand the method behind them. So my directions use towns and villages as landmarks. If cyclists stays off the fast main roads like D909, he and she will be fine. 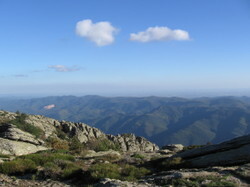 First: West: a 60-70km circle that started in Caussi and looped back into the hills beyond Cabrerolles, to St.-Nazaire de Ladarez, and then Causes-et-Veyran, Veyran, through Murviel les Beziers, St. Genies de Fontedit, Autignac, coming back to Caussi. Incredible views, vineyards and villages, knockout sunrises, desperate climbs over sharp passes into narrow valleys and then terrifying descents plunging nearly to doom. About 4 hours, depending on how much espresso you consume along the way. And don't forget the pulse quickening sprint to the top of the mountain at La Borie Nouvelle: 8 death-defying switchbacks on the way to nowhere in particular. Second: East: Gentler was the route to Faugeres, past the old train yard, and on just past the center of town by a hundred yards to a meandering slow climb on a tiny road that cuts by the town cemetery. 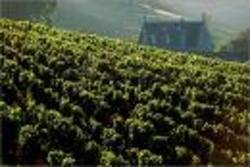 Past vineyards and sheep farms and stone walls, it leads up to a meadow at the top of a ridge. Here was a rare open pasture under an endless blue sky, rimmed by trees and a few lazy cows. A ferocious-seeming dog decided he would brook no interference until I gave him my well-rehearsed death-stare. He slunk away, suitably humbled. 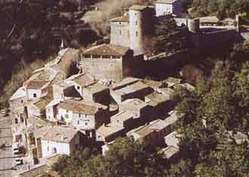 The ridgeline dropped away to a smooth, quick glide into Penzenes-les-Mines, an ancient walled village hemmed into a tiny valley. Here were many walkways too small for two people to walk abreast, let alone drive a car. If one is especially interested in pain and torure, there's a punishing schlep just past Penzenes up over the mountain, past a sizeable fortress that apparently withstood the Moors. I saved that ride for another day. Reverse direction, or take the turn to Bedarieux and back to Faugeres and Caussi. I covered about 40km. in 3 hours or less. No place to buy a snack, though. Carry a bit of baguette. 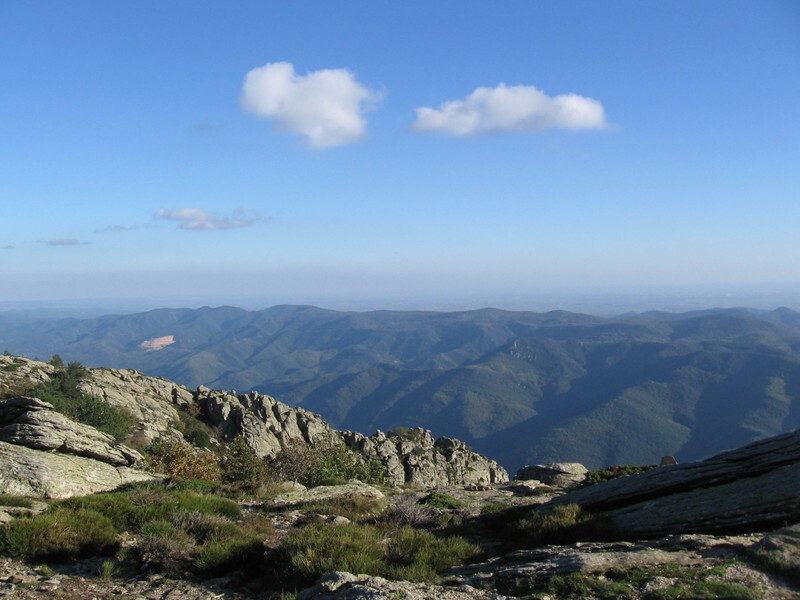 Third, Northeast: Remember the painful and punishing schlep of the previous route? That would be this one. Starting in Caussi, pedal straight through to Faugeres, and along the D909, for a mile. Here the highway can't be avoided, and it's not for the faint of heart. French drivers are demented and possessed, and this bit of four-lane proves the depth of their dementia. Take the steep and curvy road up to the one-lane tunnel to Bedarieux, and just before the tunnel, hang a sharp right onto a barely civilized rut (where was the road crew for this one?) that snakes back into a holler to the hamlet of Soumarte. It keeps going up: the intrepid cyclist is conquering the mountain that embraces little Pezenes-les-Mines, but this isn't apparent for a while. Not that there's any doubt one is pedaling up a mountain; the road meets another and corkscrews further into the sky, then unceremoniously drops a dizzying mountain's-worth in what seems like 100 yards. Suddenly, the terrain is like New Mexico; red earth, craggy bluffs, everything but turquoise-selling Indians. This road connects to Bedarieux toward the left, but going right sends you back up into the hills to a small town of pre-fab vacation homes amidst herds of goats, maybe called Les Vignes. A left turn after the prefabs (it's the only left before the road peters out) winds through a spooky, dark forest, ending at D908. Here's where we saw the Tour d'France, shivering in the damp wind the next day. Right on D908 to the first right turn, through another tiny hamlet and suddenly you're dropping a thousand feet down into Pezenes-les-Mines, sort of over the shoulder this time. Back to Faugeres over the ridge and the meadow and the wiggly farm road, and a well-deserved espresso at the bar across from the famous wine-selling gas station. Back to Caussi, after about 50km and 2-3 hours. A shorter route: A nice hour or two ride is the one from Caussi into the center of Cabrerolles, where one has the choice of two roads out. Take the left fork and glide down a mile-long hill to La Liquiere, then choose the right turn that pops up at the bottom of the hill. Within about a half-mile (1km to you metricists) take the unlikely-looking right that angles weirdly down a hill past a small barn, slip over the small river on the stone bridge, and look for the next right. That road snakes up the back side of Cabrerolles' mountain, through a drop-dead gorgeous valley devoid of anything but woods, vineyards and serious-looking hawks and eagles. Hairpin turns abound, enough to satisfy anyone who likes (or hates) heights. 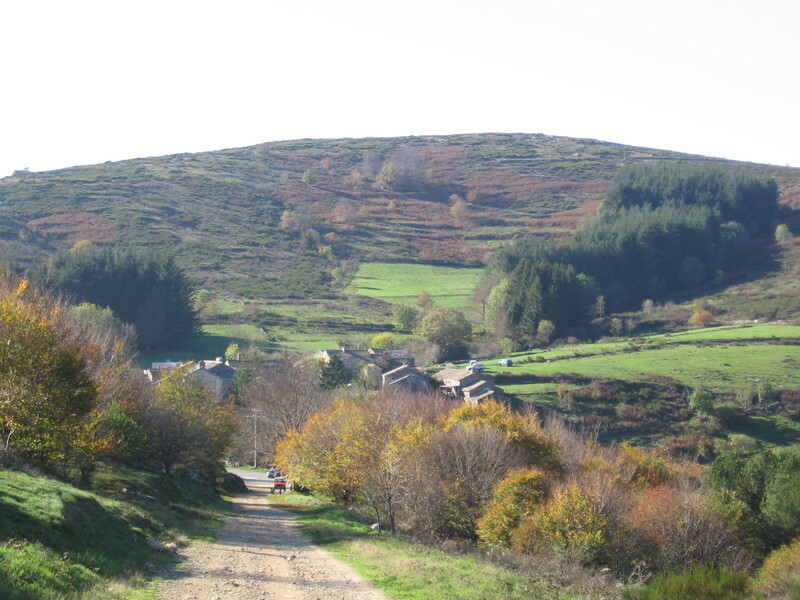 Then, when you are beginning to worry that you have really gone way too far into nowhere with no way back, a right turn appears, hidden in the apex of a hairpin curve, and carries you up over the mountain's top and down past farmers' fields back into Cabrerolles. Just in the nick of time. And a variation: Take a left at the stone bridge instead and head toward Murviel-les-Beziers. You'll meander past vineyards, following the riverbed of a mighty and raging stream that must only rage during the winter, since it was bone dry in July. Several toney-looking vintners flip by as you cruise downstream (maybe I should say downriverbed), apparently all the way to Murviel. Look for a substantial right turn as a good place to turn back, or go ahead about 6-8km to Murviel (my estimate; I only saw the other end of that road on my West Loop ride.) 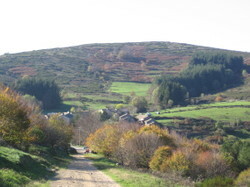 Taking the right leads to an wide green valley, mountain meadows above dotted by sheep, and leads to dusty St.-Nazaire de Ladarez. A wonderful week! I ate like a pig afterwards! And that's the whole point, isn't it? 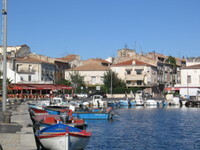 We were enchanted with the Mediterranean village of Meze (near Agde) during a visit in November 2006. Sitting in the bright sun, eating local oysters and fish stew in an outdoor cafe on the harbor was a highlight of our recent trip. The spot is apparently known to visitors from northern Europe as we heard Swiss and German spoken around us but nary a word (as usual in Languedoc) of English. Our family had so much fun in Caussi!Thank you for all the tips and suggestions. Your home is perfect. We really relaxed and embraced all that this “secret” region had to offer. It couldn’t have been more perfect! We loved the walks, the markets, the wine, the views, the weather. The best part of your sweet home is the roof top terrace. No restaurant’s ambience could touch it! 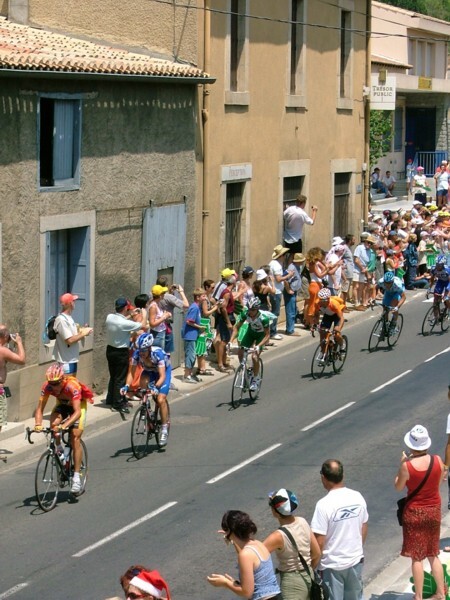 We took one day to view the tour de France and went home by way of Girona, Spain. Other than that we stayed near by because there was so much to explore and enjoy. Many thanks again from all of us!